pint-sized mama: I Was Smitten. He Was Clueless. I Was Smitten. He Was Clueless. I stood next to my mom, shuffling my feet in the church parking lot. After a week at cheerleading camp, my Mom and I were picking up my twin brother from church summer camp. I was antsy to see him after being apart from each other for a week. As I scanned the school buses full of high school kids, one bus in particular caught my attention. Well, it wasn't the bus that caught my attention. It was the boy stepping down the stairs of the bus. His head was covered in a muss of thick, brown ringlets. His piercing eyes matched his blue track jacket, and a puka-shell necklace fell on his tan skin. (Puka shells were cool back in 2004.) And he had the most chiseled jaw line my 16-year-old eyes had ever laid eyes on. This boy quickly got the attention of my mom, as she asked me, "Who is that kid?" Apparently she noticed his startlingly good looks as well. "I don't know who he is, Mom. But I gotta find out." My twin brother wrestled a few other high school kids down the stairs of the bus, and we waved him over. Still keeping an eye on Mr. Blue Eyes, I asked Taylor about his week at camp. I said hi to a few of our friends, and tried really hard to be interested in the stories of diving-board competitions and shirtless volleyball matches. But I kept trying to find ways to nonchalantly ask my brother about this mysterious new camp boy. All the sudden, Mystery Boy was walking towards me! I tried to collect myself and pretend that I hadn't just been staring at him for the last 15 minutes. What was I going to say to him? Do I introduce myself? How did I look? Before I could figure out how to get words to come out of my mouth, he walked straight up to my mother, stuck out his hand, and introduced himself. "Hi," he said. "I'm Brian Byersdorf. And your daughter has the voice of an angel." My heart jumped to my throat. Her daughter? I didn't even go to camp! But then it registered. My older sister. She sang on the camp worship team. She truly does have the voice of an angel. And this Brian kid was interested in her, not me. This was not working out like I had hoped. Ah young love. I hope you enjoyed the first glimpse of the saga that is Brian and I's love story :) There's more awkwardness to come, don't worry! Also - I still have a few spots open to showcase your shop or blog in my Holiday Giveaway & Gift Guide for the entire month of December! A listing in the blog & gift guide, ad space, Tweets, Pins, and a group giveaway! Click here for more details! And don't forget to enter yesterday's giveaway for Organizing From the Heart! 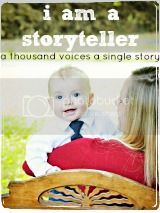 Do you have a story to tell? 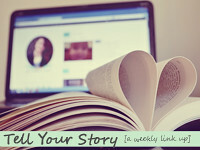 Today I'm linking up with two ladies to tell my story. Check out their link-ups below! Oh my goodness. I'm hooked already and want to read more. Such a cute little beginning to the story. Oooo, I am so excited to read this story! I love it when bloggers document their love story. Next please! This is such a cute story!!! I can not wait to hear the rest of it. : ) Thanks for sharing it with us. Oh my goodness. This is wonderful. You have such a gift for story-telling. I can't wait to read more. I love this idea! I am already hooked and ready for part 2 :) you are such a great writer! Ahh you can't stop it like that! I'm such a sucker for a good love story. Oh, I love this. So cute and I can't wait to hear how this turned out. Obviously from your bio, I know a bit but I'm a total sucker for these kinds of things. Also, I didn't know you work with YWAM. My husband and I met through YWAM and both of our parents were involved with YWAM. What kind of work are you involved with? I'm excited to get to know you more. Oh my goodness...i want to read more STAT! Oh the akwardness that is the young love...LOVE it!